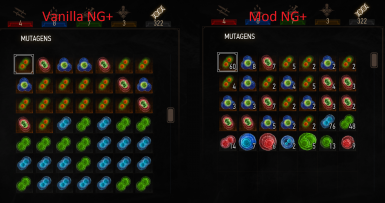 This mod fixes the NG+ bug where the mutagens doesn't stack. In one of the latest patch (around 1.30), CDPR has added a change which allows mutagens to stack in the game. This was a great addition, however, CDPR forgot to make the same changes in the NG+ file. When player start a NG+, all the mutagens (red, green, blue, and monster) has been reduced to 1. Regardless how many there were in the normal game. In NG+, no mutagens will stack anymore. This mod will fix both problems. Installing this mod before starting a NG+ should allow all the mutagens from the normal game to be imported (and stacked). Start the game. Load the NG+ save file. Go to inventory. Under the Alchemy category, find all the mutagens. Pick up all the mutagens from the ground. This mod edits the item XML. Which means it might have conflict with other mods that edits the mutagens. This mod keeps all the mutagens in its vanilla game's stats.